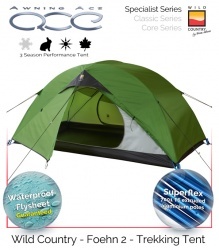 ​These tents are developed using Terra Nova's technical materials and designs which are suitable for year-round use. 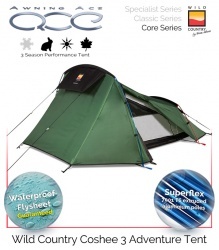 The superb tents offer a superb balance of space and low weight. 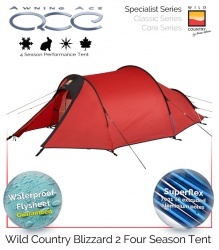 Perfect for users who are looking for a technically advanced tent at an attractive price. 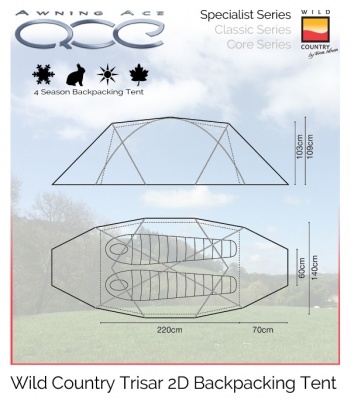 Perfect for 4 season campers, backpackers, expeditions and trekking these tents offer spacious design for greater comfort on longer camping and touring trips. As part of the specialist series the Wild Country Trisar 2D is a 2 door option of the spacious Trisar style. This 2 berth backpacking tent made from the high-performance Stormtex P4000 FR fabric, which is a polyester material with PU/DWR coating to improve water resistance. The fabric seams are tape sealed to increase weather protection and guarantees a waterproof joint. The Trisar 2D is a freestanding design which can be pitched without the outer flysheet in good weather conditions if required. 8.5mm Superflex T6 colour coded alloy poles offer maximum strength and superior anodising treatments are employed to reduce breakage and improve durability. Two full mesh inner doors make for easy access and provide protection from the smallest of flying insects and bugs. Stormtex P4000 fabrics are CPA184 tested for fire retardancy and are indicated as fire resistant. 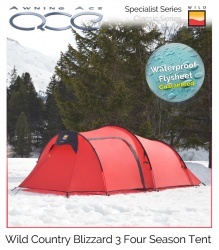 The fabric has a Hydrostatic Head of 4000mm with the groundsheet exceeding 6000mm. Blizzard 2 four season performance tent made from the ultra-high quality Stormtex N4000si fabrics, which are nylon based with PU / Silicone coatings for maximum water resistance. The 30D (denier) ripstop construction is 20% lighter than Stormtex P4000 fabrics allowing tent volume to be maintained but weight decreased. 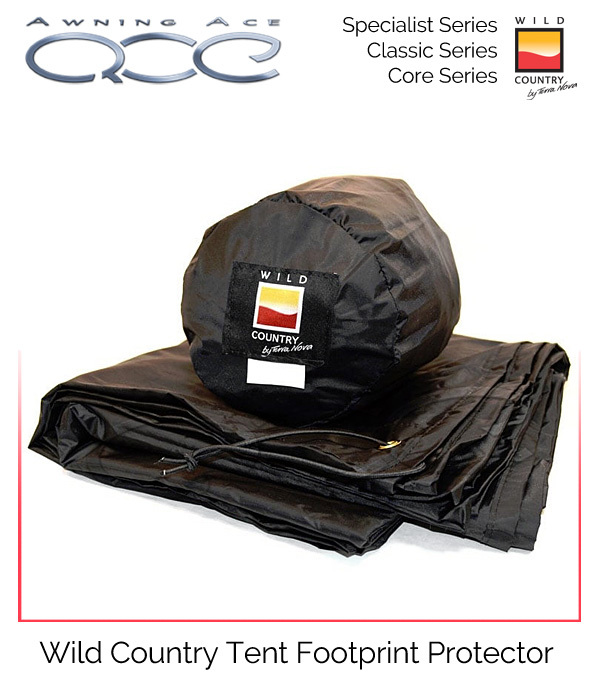 The fabric seams are tape sealed to increase weather protection and guarantees a waterproof joint. The Blizzard 2 is a high-performance tent which utilises 8.5mm Superflex T6 colour coded alloy poles offering maximum strength and superior anodising treatments are employed to reduce breakage and improve durability. The full mesh inner door makes for easy access and provides protection from the small flying insects whilst providing excellent ventilation. The Wild Country Coshee 2 has a superb low wind-cheating design with plenty of sleeping room for two adults. 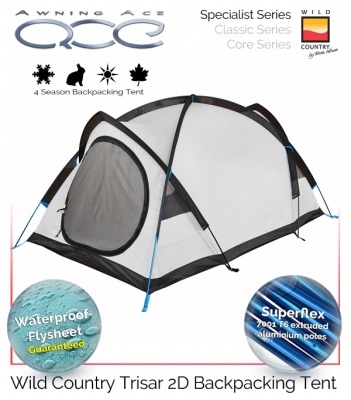 A great value tent weighing under 2kgs and ideal for 3 season trekking, backpacking or hiking. Utilising Superflex T6 Alloy colour coded poles the Coshee 2 has two access doors and plenty of covered storage space for your camping gear. Excellent bedroom ventilation ensures the sleeping accommodation remains comfortable and fresh whatever the weather. The Wild Country Coshee 3 has a weather cheating profile with plenty of sleeping room for three adults. 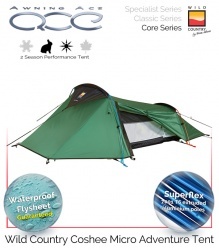 A great value tent weighing under 3kgs and ideal for 3 season trekking, backpacking or hiking. Utilising Superflex T6 Alloy colour coded poles the Coshee 3 has two access doors and plenty of covered storage space for your camping gear. Excellent bedroom ventilation ensures the sleeping accommodation remains comfortable and fresh whatever the weather. The Wild Country Coshee Micro is a superbly constructed compact starter tent for one occupant. With its low wind-cheating shape the Coshee Micro provides good overall weather protection. A large and very useful covered porch makes for excellent storage of your camping gear. Using Superflex T6 Alloy poles this tent has superb strength yet remains low in weight and very compact when packed away for your travels. 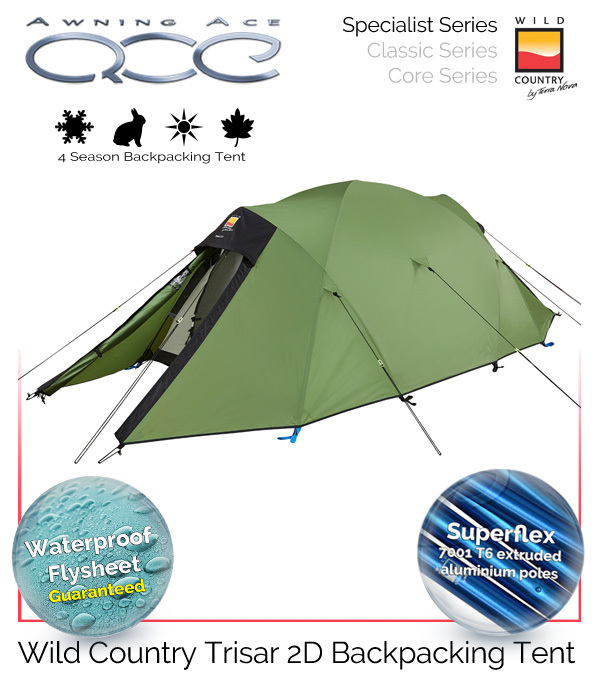 The Foehn 2 is a lightweight, spacious and highly spec'ed tent which utilises 8.5mm Superflex WC colour coded alloy poles offering maximum strength and superior anodising treatments are employed to reduce breakage and improve durability. Half mesh inner door makes for easy access and provides protection from the small flying insects whilst providing excellent ventilation.